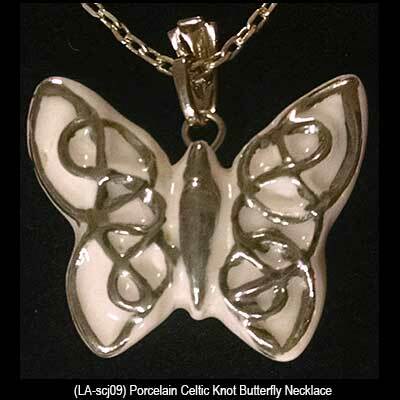 This hand painted porcelain butterfly necklace features Celtic knot wings. 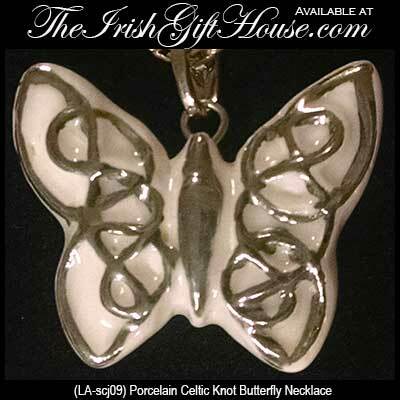 This porcelain Celtic necklace is in the shape of a butterfly. The dimensional butterfly features hand painted Celtic knot-work wings and measures 1 1/8" wide x 7/8"; a 16" long silver tone chain is included. The Irish costume jewelry is made in Ireland by Liffey Artefacts and is gift boxed a Celtic knot history card, complements of The Irish Gift House.